The Fierce Beagle: Want to know what I looked like on August 7, 2004? 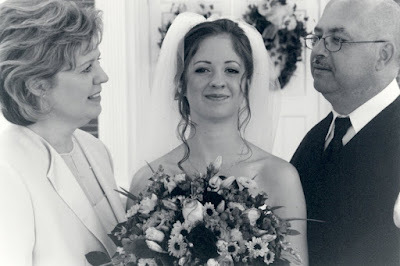 Want to know what I looked like on August 7, 2004? Sharon, the Potty Mouth, and Kevin, Mr. Sarcastic. Also, although it doesn't appear to be so, I am actually wearing a dress in this photo. It's just being covered by my monstrous bouquet. Seriously, I'm glad I carried it because it prepared me for the extra 30 pounds I'd be carrying around 5 years later. Also, if you're thinking to yourself, "Wow! those ladies have some good lookin' hair," let me tell you this: Our hairdresser for the wedding met Fabio back when it was cool to be Fabio, and she had the pictorial evidence in her styling station. So, yeah. Because a wedding just isn't a wedding without a 12-foot-tall fake woodwind instrument. Happy Anniversary! You are as pretty and Noah is as handsome today as you were that day! And look at that wee darlin you have five years later! Now I know the one thing that was missing from my reception! My hubby wore a kilt though since he lived in Scotland for a few years, so that should count for something, right?! Beautiful photos. 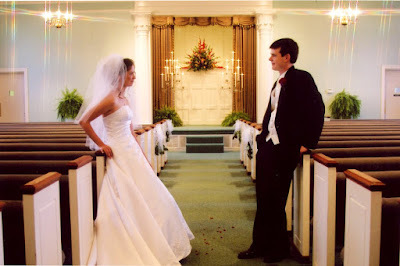 My wife and I had a very staid reception... No dancing, just a string quartet playing quietly in corner. Ahh... I love the photos. 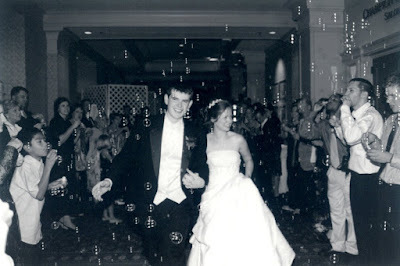 Our fifth year anniversary was July 11, 2004. This is Emily (we went to LU together). I just started reading your blog and I love it. Happy Anniversary and Happy Birthday! I hope you and Noah are doing well :). 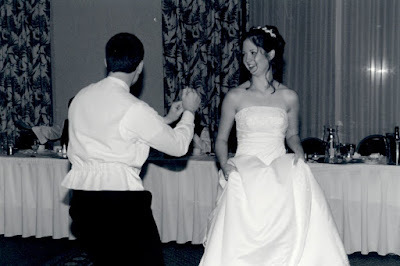 Happy Anniversary :) you have such a great sense of humor! 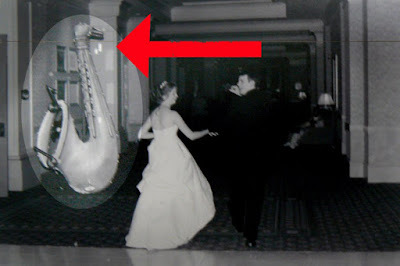 What a lovely wedding you must have had - even with the mammoth saxophone present. Hey! I was there! 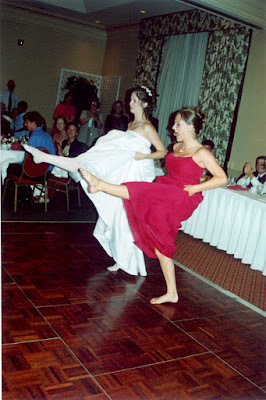 I remember you doing your Irish dance just after downing a full glass of champagne. John and I both knew it would be a good show after that! :) Also loved your dad’s toast. Happy anniversary you two! Oh the times I have said this myself. "Well, hon, I'm sorry but unless you're willing to spring for an oversized sax or at least a piccolo, it's not really going to be a party. A bash, maybe. But not a party." You. look. stunning. Happy anniversary. 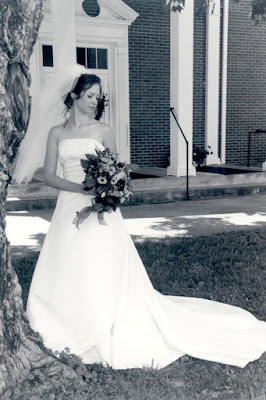 happy anniversary...cute photos, i love your dress, looks almost exactly(seriously) like one i wore december 10 2004. Costume Diva—Now I'm really going to have to crash your wedding. Emily—So glad you've been reading along! It's hard to believe I've been graduated for (yikes) four years! Despite all evidence to the contrary, I'm a grown up now. Sterling—And I'm so glad you guys were there to witness that, um I mean share our special day.